Players are ranked on a Skill Points scale. You are rewarded or deducted skill points after every game you play. The factors which determine this are difference in rank, difference in star-levels of teams, and game accomplishments (passes completed, possession, etc.). So, if you're wondering why you don't have a rank. It is because you are not within the 10,000 players in terms of skill point amount. 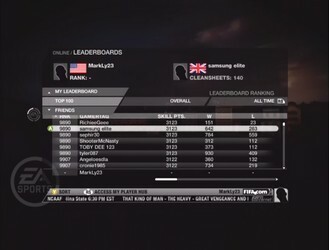 To check your rank and the leaderboards, go to Main Menu - Xbox Live - My FIFA 09 Online - FIFA 09 Leaderboards. Keep in mind that there isn't just one big leaderboard, there are many different categories such as country, friends, top 100, and others and these can each be even further categorized into weekly, monthly, all time, or 09 overall.